One of the main advantages of the upcoming Microsoft Edge web browser that is based on Chromium is that it supports multiple extension stores. 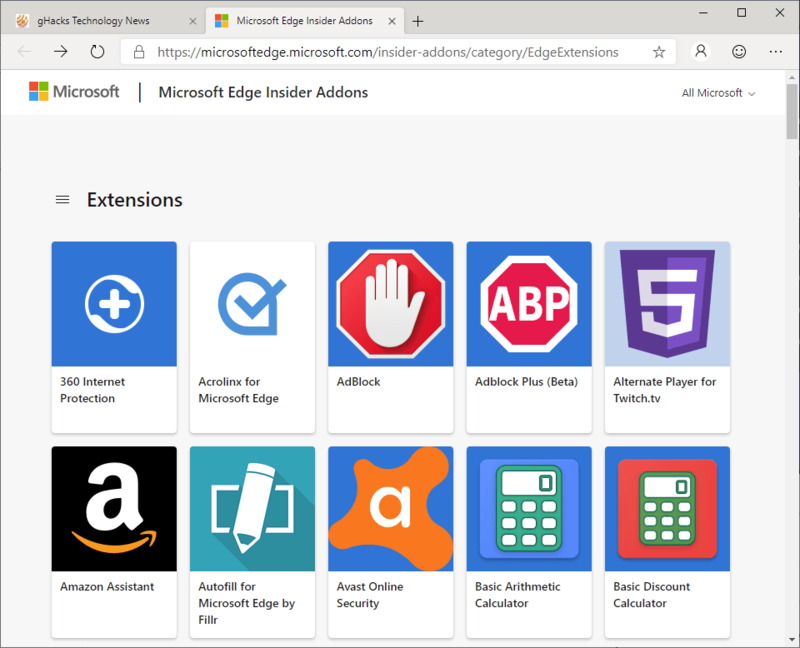 Microsoft Edge users may install extensions from Microsoft’s own extensions store for Edge, or enable an option in the web browser to unlock extension installations from the Chrome Web Store as well. But how different are the extensions designed specifically for Microsoft Edge, and the extensions offered by Google on the Chrome Web Store? Are there any extensions available exclusively that Chrome users cannot install? I decided to compare the available extensions for the Chromium-based Microsoft Edge browser that are offered on Microsoft’s Edge extensions store with what is being offered on the Chrome Web Store. Microsoft’s Edge extensions store list 117 extensions. The number of extensions on the Chrome Web Store is unknown as Google does not reveal it. The following extensions are unique to Microsoft Edge. Note that alternatives may be available on the Chrome Web Store for some of them. ClassLink OneClick — offers access to web apps and files. Download music from VK — VK music downloader. Easy Video and Audio Downloader — media downloader (does not work on YouTube). Ebates Rakuten: Get Cash Back For Shopping — shopping extension. Eno from Capital One — shopping assistant. FlipGive Max — shopping extension. Marker: Screen capture tool for professionals — screenshot extension. Microsoft Personal Shopping Assistant — shopping extension. MyPoints Score — shopping extension. Rutoken Plugin for Edge — digital signature, encryption, and 2FA extension. TrueKey (McAfee) — password manager. Video Downloader Professional for Edge — media downloader. Vonage Integration Suite — communication extension. 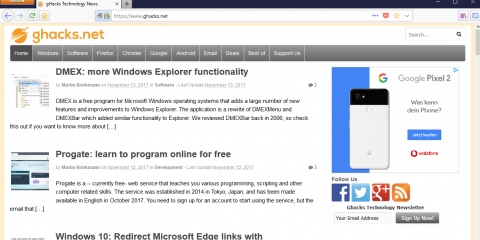 A total of 14 extensions are exclusive and may be installed in the Chromium-based Microsoft Edge browser. That leaves 103 extensions that are not unique and also available on the Chrome Web Store. Some users may wonder why Microsoft bothers with its own extensions store if most extensions are available on the Chrome Web Store as well. We need to look at the extensions that are unique in more detail to answer that question. The three main categories are shopping, media downloads, and Enterprise functionality. Shopping may come as a surprise to many, media downloading not so much. One of the limitations of Chrome extensions is imposed by Google policies. Extensions may not offer functionality to download media from select Google properties such as YouTube. Microsoft does not impose the same limitations on extension developers (Mozilla, Opera, and other browser makers don’t either). Maintaining an extension store for the Chromium-based Edge browser offers several advantages. It gives Microsoft full control over extensions including its own vetting and verification process. One of the main advantages is that extensions may offer features and options that Chrome extensions don’t support in that form. Now You: Have you tried the new Microsoft Edge? What is your take so far? Ghacks needs you. You can find out how to support us here or support the site directly by becoming a Patreon. Thank you for being a Ghacks reader. The post These Extensions are exclusive to the Chromium-based Microsoft Edge appeared first on gHacks Technology News.